MATT REDMAN: Britain’s biggest and most effective male artist is back and how! ‘Glory Song’ is a simple but effective title for the new album from British singer songwriter and worship leader Matt Redman. It hits the heights. The accompanying press release from the company that issues the album, Integrity, reminds us that this artist is past twenty years of ministry. So to the press handout wishes to say that in this collection he is “capturing the heart of ministry in a new way” and that means he comes with a gospel choir, utilising the vocal charm of Tasha Cobbs Leonard and the liveliness of taking in the feel of spontaneous worship. He delivers lyrics that depict God’s glory, the cross, and a shout that we need to return to true faith, true worship, although in itself hardly an innovative shout, for people keep saying this without always exactly suggesting what is meant, although it always sounds shall we say, impressive and worthy. Not unexpectedly Redman goes for the big sound, and so with a degree of rawness there’s a charging element to the track ‘Gospel Song’ that comes with one of those typical Redman refrains that will adorn gatherings with the repeated “Glory hallelujah’ with the cry of “sing for the whole world,: the love God has shown in His Son. Next track ‘Your Ways’ rolls in with acoustic guitar and a few ‘space’ sounding effects with a seeming audience singing along as the artist sings of God’s ways where “You always keep your promises” and piano and organ prominent. He sings of a grace that is as common as the morning sun. Gospel chords bring us into ‘Hope is Marching On’ with close mic vocals. Clear and concise is his delivery on this gospellish number with choir as he spells out “You take the weight of this world on your shoulders.” Short sharp sung lines and very prominent piano underpins a persuasive song. ‘Simple Pursuit Gospel Song’ pleads that we remove all else and find that clear faith that was once ours. Tasha Cobbs Leonard sings with him, effectively. This is one of his slower songs that grows with synth helping to thicken things along, and arguably maybe at times too much is thrown into the mix although cleverly its removed as he passionately calls us to return to holiness and a repeated ‘Bring us back,” and he adds “the angle sing ‘holy is your name.’ At the end the big sound is there to take us back perhaps to sound as the music of the heavens. Kim Walker Smith joins for ‘Place of Praise” and this is followed with ‘Still I Will Sing” and then “Questions (You Are Faithful) which has an attractive rhythmic underpinning, as he sings about the words of the Cross; “It is finished’ to which he says “God be praised.” Madison Cunningham is featured on ‘Redemption Ground’ that starts off with an atmospheric choir as Matt sings of the grace of calvary that is “Redemption ground,” which has been visited by the saints and where “all my hope is found.” Tasha Cobbs Leonard gets another backing vocal moment on ‘Gracefully Broken” although initially Matt Redman leads the vocal journey on another big sound affair that has some passionate moments with Tasha suggesting she has a wonderful voice. We should hear more of her. By now the listening has reached track 11 and ‘One Day (When We All Get To Heaven) and then ‘Greatest Hallelujah,” and which surely comes with no surprise given the title that here is a powerful song with suitably strongly vocals and a strong drum in the mix. The choir is back and well, it takes off in memorable fashion, as Redman sings once more “Holy is the Lord.” Again, it’s another track that needs a big room and a power system to reap the full effect. And so to another mighty number with ‘All Glory’ that almost seems to have a cast of thousands, and well, it will be sung and sung at big praise gatherings, and the shout “Glory to your everlasting name,” will resound and bring people to their feet. Near the end it almost breaks into what I can only call ‘gospel harmony’ and leads you to think if only it was developed, such a catchy brief minute or two. So to the end and ‘Gospel Song’ – no let up for yet another big affair number, and those so clear Redman vocals that sing about an empty cross and an empty grave. He urges to sing on of how broken lives can rise again. Here we return to John 3: 16 and the good news of which we must “sing on” and once more “Glory hallelujah, Jesus forever.” The Gospel choir lurk in the background and there is some rap, and in praise hit songs category , here is another that will rock the stadiums. Matt Redman delivers! Indeed another fine worship album, and if there has to be a slight disclaimer it’s one that can be applied broadly across the ‘praise’ world – it is yes about faith, it is yes about personal faith, but the big world out there is only seen as a place to sing songs of worship, it never has flesh of its own, and meaning if he mentions along the way a “broken’ world what then is the “Broken” element? If you can take a trip way back to Larry Norman albums such as ‘Upon this Rock’ and especially “Only Visiting his Planet” or early Graham Kendrick sets you find endless references to what is happening “out there” for where say is the current JM singer who might wander into the world of mental awareness and difficulty, of gender issues, of teen problems with self and physical appearance, of school or peer group pressures, of internet bullying and so one could continue – hopefully I make sense. TJ. My name is Megan and I am a counsellor, specialising in childhood cancer. For one year I am volunteering with the charity World Child Cancer. I am going to be supporting children with cancer, their families, and the medical staff in Ghana, Malawi and Myanmar. I have been in Ghana for 5 months now and so far, it has been both an incredible experience and a heart-breaking one. Amongst many things, two issues have really struck me: The first is the amount of children who arrive with very advanced cancer, often having been misdiagnosed a number of times. This is due to lack of awareness. The second is the immense financial burden that families of the children face and the impact this has on their lives. I can’t even begin to imagine what it must feel like to know your child has cancer but to not have the money to pay for their treatment. It is very tough knowing that if many of the children I have been working with were in the UK, things would be very different for them. Thank you so much for taking the time to read this, and thank you in advance for any kind contributions you give. Every two years The Arts Centre Group runs a playwriting competition. JESUS IN THE BROOM CUPBOARD? Fred Backhouse: An old stalwart – who runs the Comeback Cafe , providing meals for the Homeless. Antonia Champion : a student and a volunteer at the Mission. tbc Pastor Derek – in charge of the Help and Hope Mission. Tony Jasper Councillor Angela Warburton. A local politician. Angela Warburton - a local politician. Tony Jasper brings to the fore questions around the wearing of jeans, gowns, bling and vestocks, Just how a presbyter (minister) should dress came up recently at the Church of England Assembly. The most popular question lay in asking: ‘Should the clergy wear jeans?’ This was discussed and debated in the gravity that only the clergy can muster. As yet Methodism has not indulged in such a serious issue, but on the other hand clergy dress is an important item, especially when considered in worship terms. Dress does say something about the person, and without claiming too much is there not a theological perspective in someone’s ‘dress’ at least in terms of how that person sees faith, of their presence so visible before the people?. Does it matter how they are seen? Conversely some want to jettison existing traditional garb because it seems obscure, and not in tune with say “praise’ style worship with its informality, and so here cometh jeans! We have either forgotten or pushed aside, that things do change, at least in non-conformist circles - take the simple fact that the pulpit gown gained popularity in the twentieth century among those Protestant groups wishing to recover their Reformation connections. In some denominations the gown is connected to an academic gown and this is expected in some of the United Reformed churches where I have preached. It is assumed I will be decked accordingly, but then in all cases the worship is assumed to be well structured, cerebral, and given an air of respectability. Wearing bulky ill-fitting jeans in such a context would be quite out of place. Daniel Benedict from the American United Methodist Church sees the gown communicating ‘gravity, learning, bearing and presence.” Those against are likely to be churches who do not name a persons academic record on the plan, and where the reason is not to make those without a degree seem less. So, does a congregation respond differently to a Tony Jasper B.D.M.TH, Dip.Ed or a simply Tony Jasper? And should they? However to take “praise worship” can mean a “dressing down” because I want a freedom of feeling and action that is not easy when encumbered with gown and hood. There is no statistical information available about how many Methodist ministers have even a tattoo somewhere on their anatomy, but one assumes among the more trendy, and those who like to feel they are following secular trends, there are some. More certain is an undoubted growth in the clergy as to how they should look, not in hair colour unless it is white to suggest wisdom, especially in worship. Women always have an advantage when it comes to style and even bling, whereas the male presbyter is traditionally dour, although if the jacket fits, and the trousers ironed, the hair given style, shoes cleaned and properly laced, there is a sense of the bank manager of old, dress to be respected. There is something to be said about the black vestock and white unstained collar worn by the male. Certainly companies with a sales pitch to the male have been busy plotting as to how they can create the male pheasant. It would seem there are other colours than black and grey, and purple available for those with courage, but I may be looking at adverts of vestocks for women. Those with due clothing to sell should be thinking of waistcoats or cardigans for the male but with a degree of looseness, lest one has view of a beer-belly minister, and that is most off-putting. Not so long ago at a Christian Resources Exhibition, our much loved former President, Brian Hoare, strutted the catwalk in a very colourful cassock. Perhaps fearing muttering in the more severe corridors of Methodism he said:”I was just helping out.” It seems the chosen model could not be present as he was stuck somewhere in a white snow drift. Let’s say it was a brave and commendatory thing for Brian to appear in front of clergy from the many denominations and Christian concern who only recognise black or for a special treat, grey. Certainly not long after there was a letter writer in the Reform magazine of the United Reformed Church who was outraged by the whole affair, and more so when a URC minister wore a saffron chausible tagged at £650, and that without the dreaded VAT! More so, revving up some more steam, the letter writer said long-time back hero Richard Baxter would have been astounded as such a faith expression. Somehow the fact that Baxter is of the 17th century and with Puritan leanings escaped our religious Mr. Angry. A Revd Tom MacMeekin is instanced in saying he has never thought black was an appropriate colour for ministry today. Still, on the right person male or female, gown and bands and small height of collar do make for a distinguished minister, more so if in height six feet or more. There is mileage on seasonal church vestments for those with a pitch toward Canterbury, and, as some of our ministers do now, the colourful long narrow scarf we call a stole. While there’s always a question of what shall be worn, the matter finds current relevancy with the recent decision of the fashion committee of the Church of England that it may be permissible for clergy to wear jeans when they are taking a service. That said, the local curate of the parish where I live, Kirsten Norfolk, in her twenties, told me it doesn’t really matter if you are wearing a cassock. Obviously many of our clergy sport a cassock, but I confess I would possibly be deflected from my worship commitment by wondering whether he or she has jeans beneath. Many years ago when things were shall we say more defined as right or wrong, there was in West Cornwall the gossip to the effect that a young minister sported a cassock, then not generally worn, and certainly not in the far West, that blew open from a gust of wind, and he was revealed wearing a bathing costume. It was not the garment that caused offence so much as the fact that he gone swimming on the Sabbath and worse, before a service. One assumes there will be those who will treat this delicate matter of clergy dress, for street or church, as irrelevant, for they will be more prone to ask: “Is the Gospel being preached?” and one would hope so, but for all that we do respond as people to how we dress, and feel about ourselves, and how we see others. Of course in Methodism some of these issues may be seen irrelevant for the hardline is the ill-fitting suit, possible vestock that could do with a clean and whatever else you can summon up. In a sense the ‘jeans’ issue is just another topic that will be he here and gone tomorrow, yet there is something more than fashion involved. The seeming cry for wearing jeans is about getting alongside the people, about seeming ‘normal’ (whatever that is) but for me, so what. There is something amiss about trying to be one of them’ as though it curries attention and respect. I have noted several clergy dressing down for “praise” worship and never as it were “making it’ – it was not them. Even in general wearing terms jeans can look somewhat uncomfortable on some, whereas for others they can look ace, especially if I am not being sexist, on a woman and with a crisp clean ironed white shirt. As a lay-preacher it is not easy. Much of my life has been lived in London and when taking services there I invariably sported a gown, and indeed it was mandatory in my frequent forays into the URC world with their gowned choirs, and Presbyterian influence. However, I was brought well and truly short when on returning to my beloved Cornwall I was physically apprehended in the vestry by an irate steward. He didn’t exactly tear the gown from my body but shouted “Not’ere, my ‘andsome, not ‘ere.” That said, I was reported when in London for not wearing a tie in taking worship. Apparently I showed dis-respect to the congregation and an overall lack of manners in the formal setting. My practice is a black T-shirt and cross. Oh, and of course trousers.I have had only a few objections in these more latter days in Cornwall than the gown incident, but it has been termed ‘churchy.’ A greater and welcome growth of women in the presybyteral ministry should hopefully drive men into feeling more comfortable, and colourful. I wonder what sort of bling? This first appeared in slightly different form in The Methodist Recorder. In an age of fake news what place is there for gospel truth? In the online war of politics and cultures where is the gospel of peace? Diocese of London Creative Arts event hosted in partnership with the Haven + London. Can good stories tell a godly story? New Testament scholar Dr Paula Gooder, and Anglican priest and journalist George Pitcher will discuss the nature and purpose of story-telling, from the gospels to contemporary fiction. Entries on the theme of migration required. Entries Free. Riding Lights are this year celebrating their 40th anniversary. 10 November. Pantomime - Babes In The Wood. 6-9 December 7.30pm Sat Matinee 2.30pm. Christopher Norris has taken inspiration from this Icelandic tradition to launch the Jabokaflod Book Campaign - a reading initiative to encourage people everywhere to buy books to give to their loved ones to read over the festive season. As some of you will know, the Against the Grain tour has got off to a very good start. Three great days in Scotland, then three excellent days in the Midlands, and just recently a very warm evening at Chelmsford URC church. 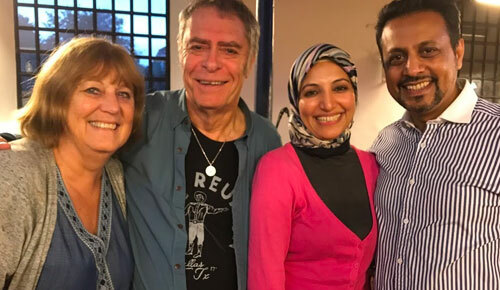 Here Gill and I are with Salma Yacoob, Politician and Chair of Birmingham Stop the War Coalition, and Dr Waqar Azmi, Chair of Remembering Srebrenica - who came along to the Lichfield gig. Now the tour is on hold for a few weeks as Gill and I are heading off to Nicaragua for the 45th Anniversary of Amos Trust’s long time partner in Nicaragua, CEPAD. 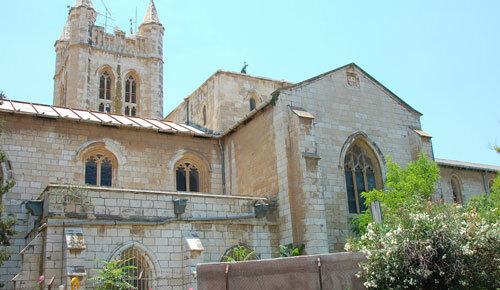 CEPAD is a council of churches relief and development agency. I can remember singing at their 25th Anniversary, so it’s very special to be going back to do concerts and even a sermon or two. Soon after that it’s across to Palestine for events relating to the hundred years since the Balfour Declaration on November 2nd (see my last newsletter here for more on that). On the 2nd we will be linking up with the long-time walkers of Amos Trust's Just Walk to Jerusalem group, at 11am doing an event at Banksy’s Walled Off Hotel, by the wall in Bethlehem, where he has an exhibit about Balfour, and then doing a service at St George’s Cathedral Jerusalem at 5pm - a Balfour liturgy taken by myself and the Dean, Hosam Naoum - which I told you about in the last newsletter. And again, Chris Rose will be bringing the Amos walkers, and we are going to be joined by others including a church group from Canada. Last time I wrote, I encouraged you to do something in your church around the 2nd of November – perhaps Sunday the 5th. You could use the Balfour liturgy that I have produced – available for download here and do read a section from the Christians' call as well... they long for us to speak up on this issue. In November the concerts start again, mostly Against the Grain, until we creep closer to Christmas - but there is one event I particularly want to mention, on the 29th of November. I’m doing a charity concert for the church that Gill and I attend, St Botolph’s Aldgate - a beautiful church that stands between the City and the East End. We have been made very welcome at St Botolph’s and find it to be a warm and very interesting community. They have a variety of areas of ministry but regular lunchtime concerts is one aspect of what they do. And they need to raise funds for a new piano for those, as I gather the current piano is losing legs! 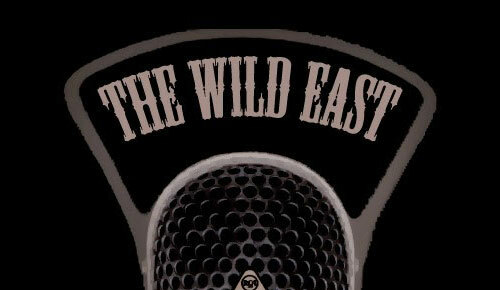 We have various musicians in the church including Charlie Knowles who has a country band called The Wild East, and they will be performing. Also our Music Director Matthew Dunn will be taking part on piano at various points in the evening, and I will be joined by two or three members of the band that have been with me the last few years - Paul McDowell on accordion, Pete Banks from After the Fire on backing vocals, and Abbie Goldberg also on backing vocals. I will do a variety of songs from country through to carols. It will be very much a fun evening and for Gill and myself it’s a way of saying thanks to a beautiful London church that has been a spiritual home for us. 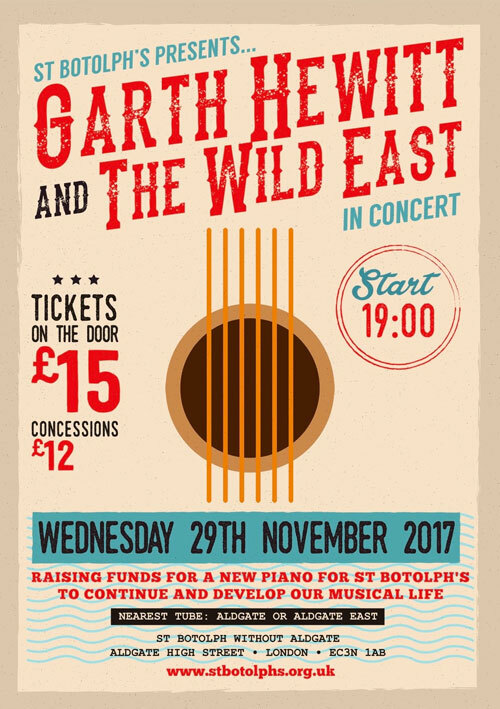 The gig starts at 7pm and will finish at 9 - and I would welcome as many as possible coming so we can get a piano which can support the ministry of the church without doing the splits as someone is playing it! The church is right next to Aldgate tube station, quite close to Aldgate East, and fairly close to Tower Hill. If anyone is able to come and join us as we say thank you to St Botolphs, I would personally be very grateful. This concert falls just a few days before the start of Advent. The first Sunday in Advent is December 3rd and so this concert will be a few days before we light our first Advent candle. I love this time of Advent, this time of holy waiting. Grateful for the fun we can have together. This church that has welcomed so many, including asylum seekers. To the holy waiting time of Advent that will soon be upon us.